Abstract. The AlborEX (Alboran Sea Experiment) consisted of a multi-platform, multi-disciplinary experiment carried out in the Alboran Sea (western Mediterranean Sea) between 25 and 31 May 2014. The observational component of AlborEx aimed to sample the physical and biogeochemical properties of oceanographic features present along an intense frontal zone, with a particular interest in the vertical motions in its vicinity. To this end, the mission included 1 research vessel (66 profiles), 2 underwater gliders (adding up 552 profiles), 3 profiling floats, and 25 surface drifters. Near real-time ADCP velocities were collected nightly and during the CTD sections. All of the profiling floats acquired temperature and conductivity profiles, while the Provor-bio float also measured oxygen and chlorophyll a concentrations, coloured dissolved organic matter, backscattering at 700nm, downwelling irradiance at 380, 410, and 490nm, as well as photo-synthetically active radiation (PAR). 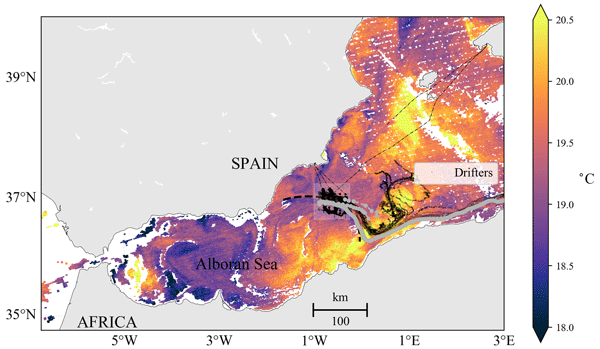 In the context of mesoscale and sub-mesoscale interactions, the AlborEX dataset constitutes a particularly valuable source of information to infer mechanisms, evaluate vertical transport, and establish relationships between the thermal and haline structures and the biogeochemical variable evolution, in a region characterised by strong horizontal gradients provoked by the confluence of Atlantic and Mediterranean waters, thanks to its multi-platform, multi-disciplinary nature. The dataset presented in this paper can be used for the validation of high-resolution numerical models or for data assimilation experiment, thanks to the various scales of processes sampled during the cruise. All the data files that make up the dataset are available in the SOCIB data catalog at https://doi.org/10.25704/z5y2-qpye (Pascual et al., 2018). The nutrient concentrations are available at https://repository.socib.es:8643/repository/entry/show?entryid=07ebf505-bd27-4ae5-aa43-c4d1c85dd500 (last access: 24 December 2018). How to cite: Troupin, C., Pascual, A., Ruiz, S., Olita, A., Casas, B., Margirier, F., Poulain, P.-M., Notarstefano, G., Torner, M., Fernández, J. G., Rújula, M. À., Muñoz, C., Alou, E., Ruiz, I., Tovar-Sánchez, A., Allen, J. T., Mahadevan, A., and Tintoré, J.: The AlborEX dataset: sampling of sub-mesoscale features in the Alboran Sea, Earth Syst. Sci. Data, 11, 129-145, https://doi.org/10.5194/essd-11-129-2019, 2019.